Today I received one of the best compliments about a baked good I’ve ever heard. First, a little background: My father, who’s visiting from Southern California with my mom, is one of my favorite people in the world and also one of my biggest critics. I really believe the saying “tough crowd” was invented with him in mind. It’s not that he doesn’t care and it’s not that I feel like I can never be good enough for him. It’s just that my dad doesn’t sugar coat anything. Like, nothing. He doesn’t care for fluff, he plays devil’s advocate like it’s his full-time job, and he’s Italian so he’s more than happy to share his opinions with you whenever and however he likes – and whether you like it or not. 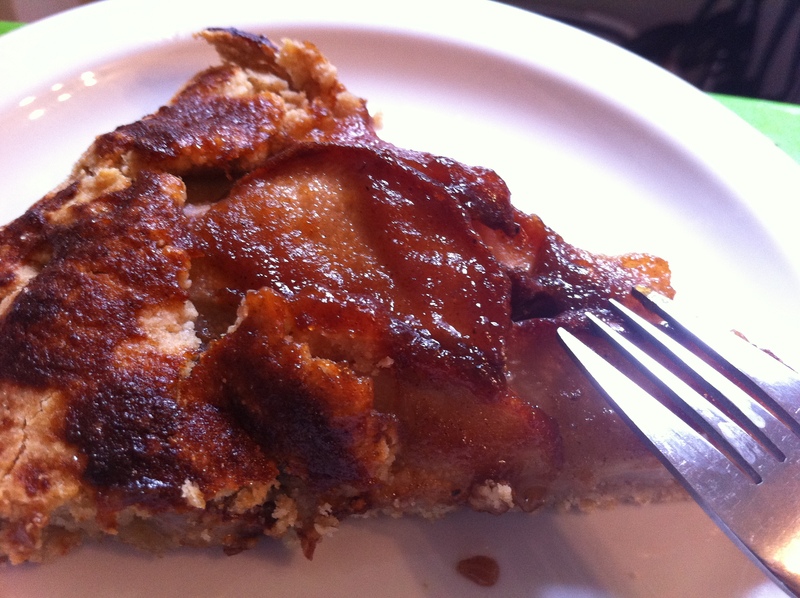 When I was a teenager I decided to bake an apple pie using the apples from our backyard tree. Apple pie is my dad’s absolute favorite. I didn’t kid myself into thinking any pie of mine could live up to the time-tested nostalgia of my grandmother’s — my dad’s mom’s — creations, but I figured that by baking my dad’s favorite dessert, I surely couldn’t fail at pleasing him. After his first bite, I could barely wait for him to finish chewing before asking him what he thought. 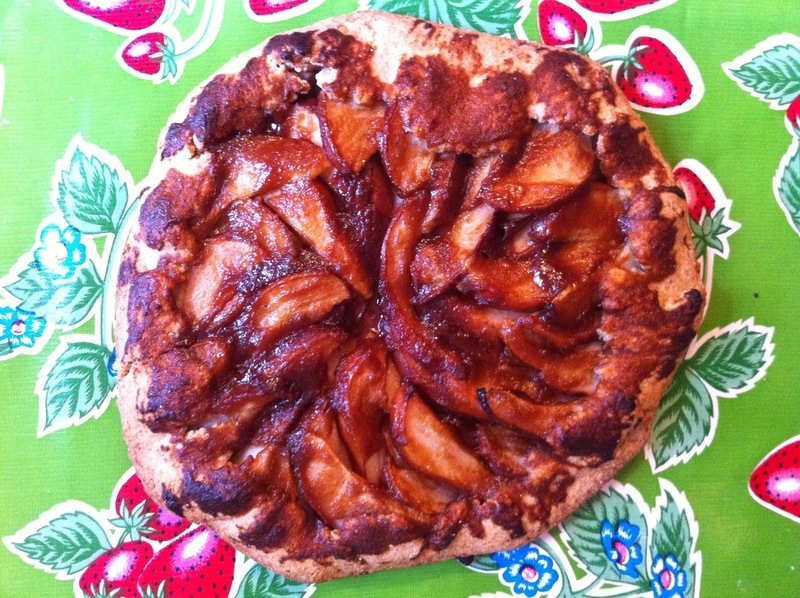 Without missing a beat, as always, he said, “It could stand to have baked longer; the apples are undercooked compared to how I like them, but some people prefer them a little firm.” I was disappointed but not surprised. I brushed it off, told myself I didn’t even think the pie turned out that great anyway so why bother getting offended at honest feedback. Later that night, I caught my dad helping himself to his third piece of pie. When I confronted him, jokingly saying I was under the impression he didn’t think the pie turned out very well, he scoffed and said “Well I’m just saving others from being forced to eat it.” How noble. That pie disappeared in not much more than 24 hours, thanks to my dad’s willingness to take one for the team and spare the rest of the family from impending gastrointestinal doom. Even though my dad would never give me the satisfaction of a verbal compliment, I was happy to settle for the one I got. Gasp! A compliment! Unsolicited! I hadn’t even dared ask him what he thought of the tart. I knew better by now. I could already hear him say “too much cinnamon but I like the almond in the crust” or “overcooked, but the flavors aren’t bad.” So to hear him say what he actually said was more than a shock; it was a revelation. I could bake something and my dad wouldn’t even have to knock it down before he complimented it! I have long since stopped trying to please my father with my culinary masterworks. I take the compliments where I can get them – the third slice of pie in one night, a half of a loaf of banana bread in one sitting. I’m not sure if he’s gone soft or if my baking skills have really improved that much over the years. I suppose it could be both. Whatever the case, some things will never change, like the unexpected and total satisfaction of pleasing your toughest critic when you least expect it. Lightly spoon 1.375 ounces whole wheat pastry flour into a dry measuring cup; level with a knife. Combine 1.375 ounces whole wheat pastry flour, ice water, vinegar, and almond extract in a small bowl; stir with a fork until well blended to form a slurry. Set aside. In a medium mixing bowl, combine remaining whole wheat flour, oat flour, 2 tablespoons sugar, almond flour, and salt, stirring with a whisk. Cut in butter with a pastry blender or 2 knives until mixture resembles coarse meal. Add slurry; stir just until moist (sprinkle a little more ice water if necessary to moisten). Turn dough out onto a lightly floured surface; knead lightly 5 times. Gently press dough into a 4-inch circle on heavy-duty plastic wrap. Cover with additional plastic wrap. Carefully roll dough into a 14-inch circle; freeze for 10 minutes. Remove dough from freezer; remove top sheet of plastic wrap. Let stand 1 minute or until pliable. Place dough, plastic wrap side up, onto a baking sheet (I used a square cookie sheet) lined with parchment paper; remove remaining plastic wrap. Combine cornstarch and 2 tablespoons sugar; sprinkle over dough, leaving a 2-inch border. Arrange pears spokelike on top of cornstarch mixture, leaving a 2-inch border. Fold edges of dough over pears (dough will only partially cover pears). Combine jam, 1/8 teaspoon almond extract, cinnamon, cardamom, and syrup in a small microwave-safe bowl; microwave on HIGH 45 seconds. Brush jam mixture over pears and dough edges. Sprinkle with remaining sugar. Bake at 400° for 35 minutes or until crust browns. Remove from oven. Cool 10 minutes. 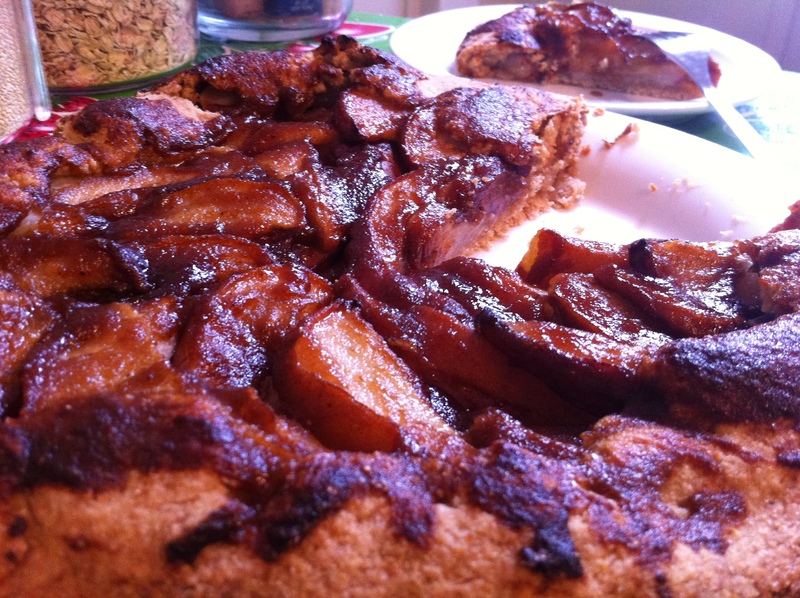 This entry was posted in Pie and tagged almond oat crust, crostata, pear. Bookmark the permalink.